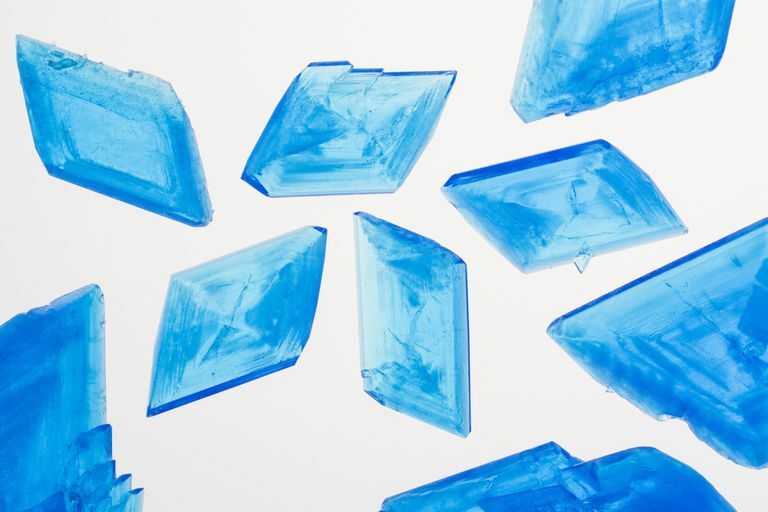 Copper sulfate crystals are among the easiest and most beautiful crystals that you can grow. The brilliant blue crystals can be grown relatively quickly and can become quite large. Copper sulfate is harmful if swallowed and can irritate skin and mucous membranes. In case of contact, rinse skin with water. If swallowed, give water and call a physician. Even a small increase in the temperature of the water will greatly affect the amount of copper sulfate (CuS04 . 5H20) that will dissolve. Copper sulfate pentahydrate crystals contain water, so if you want to store your finished crystal, keep it in a sealed container. Otherwise, water will evaporate from the crystals, leaving them dull and powdery from efflorescence. The gray or greenish powder is the anhydrous form of copper sulfate. Copper sulfate is used in copper plating, blood tests for anemia, in algicides and fungicides, in textile manufacturing, and as a desiccant. Stir copper sulfate into very hot water until no more will dissolve. You can just pour the solution into a jar and wait a few days for crystals to grow, but if you grow a seed crystal, you can get much larger and better-shaped crystals. Pour a little of the saturated copper sulfate solution into a saucer or shallow dish. Allow it to sit in an undisturbed location for several hours or overnight. Select the best crystal as your 'seed' for growing a large crystal. Scrape the crystal off of the container and tie it to a length of nylon fishing line. Suspend the seed crystal in a clean jar that you have filled with the solution you made earlier. Don't allow any undissolved copper sulfate to spill into the jar. Don't let the seed crystal touch the sides or bottom of the jar. Place the jar in a location where it won't be disturbed. You can set a coffee filter or paper towel over the top of the container, but allow air circulation so that the liquid can evaporate. Check the growth of your crystal each day. If you see crystals starting to grow on the bottom, sides, or top of the container then remove the seed crystal and suspend it in a clean jar. Pour the solution into this jar. You don't want 'extra' crystals growing because they will compete with your crystal and will slow its growth. When you are pleased with your crystal, you can remove it from the solution and allow it to dry.